Another doodle from the bathtub on Saturday afternoon. Here’s a note from the back of a vintage Pitt Press Shakespeare edition of Julius Caesar. Amaz’d is not the only word that was a stronger word then than now. Words and Christmas stocking fillers have suffered from inflation over the years. 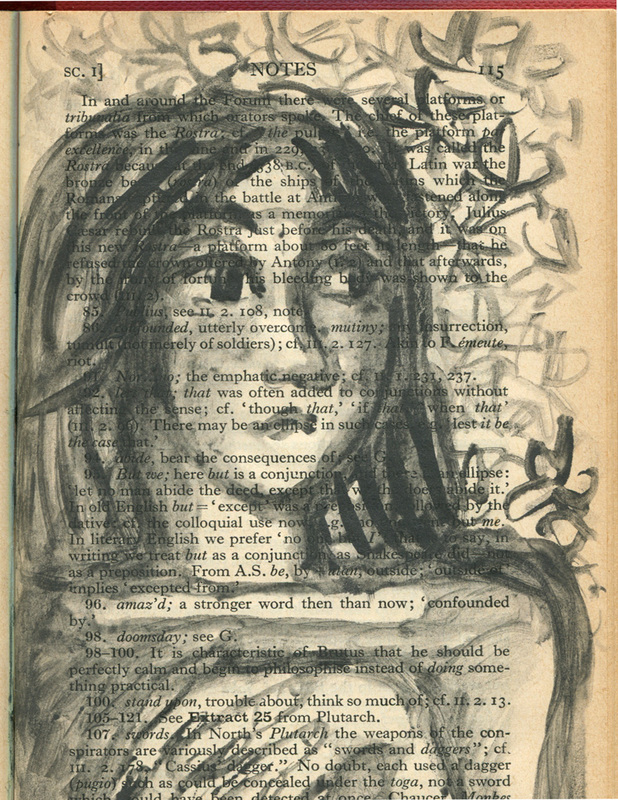 This entry was posted in altered books, books and reading, writing and tagged altered books, ArtGraf, graphite, inflation, language, Shakespeare, words on May 11, 2015 by Judy Watson. Oops, pressed ‘send’ too soon! Next step …you will be doodling on yourself when you run out of paper, and you’ll get out of the bath dirtier than when you went in! I’m enjoying the word info, funny how some words change their meaning and others do not. It wouldn’t surprise me at all to find myself dirtier getting out of the bath. I remember the water soluble bath crayons when the boys were younger. The BEST fun and SO MESSY!